Remember when I was head over heels over the newly released Trashy Diva Mahjong print last week? Well here it is, in all its kitschy glory! While I gravitate more towards Trashy Diva's 40's inspired styles (the Ashley dress is my favorite), this 50's inspired Annette dress has rapidly taken my heart. 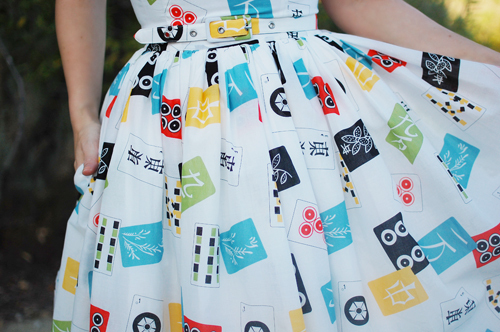 As a novelty print enthusiast, this new collection has my name written all over it. I'm sure you can see why I rushed to put this one in my closet! I can't remember if I mentioned this before, but this past February marked my fifth year with my blog. I consider that quite a milestone! There have been times of frustration, disappointment, and thoughts of giving it all up, but the good outweighs the bad ten fold. I love the documented journey this blog has allowed me to reflect upon and, most importantly, the friendships that have come from it. I also just hit 20,000 followers on Instagram last week, which prompted me to host a VERY BIG giveaway as a thank you to everyone for supporting me. You're definitely going to want to get in on this and I'm super excited to announce everything on Friday. Keep those eyes peeled!! !